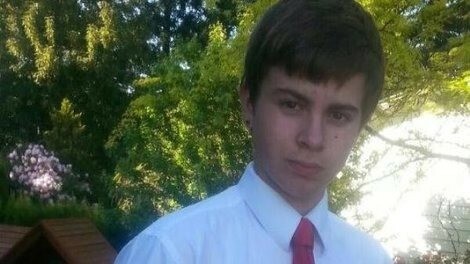 Emilio Hoffman, a 14 year old freshman at Reynolds High School, was selflessly taken from his family on the tragic events that took place June 10, 2014. His life was robbed from him. This fund raiser site is full backed by the Hoffman family and Reynolds District. Please keep the Hoffman family AND Padgett family in your prayers. It is outstanding what community can do and what social media can do. Share share share share. The Anthem Church is here to counsel students, family, teachers, and anyone who was involved in the tragic inciddents that transpired on Tuesday June 10 at Reynolds High School. My name is Daniela Makowski, I attended Reynolds High School from 2005-2008, graduated as the valedictorian and attended George Fox University and now work at Columbia Helicopters as a mechanical engineer. I am from Portland, Oregon, my parents still live in Troutdale a few blocks away from Reynolds High School. I am not related to the student fatally shot, I had Todd Rispler (the teacher injured) as a teacher and track/field coach during my high school years. I am in direct contact with the Hoffman family and they are truly grateful of the generosity and kindess that has been shown through this site. The family is setting up an account where all these funds will go. My intent is that the funds be used for the student's funeral expenses. Reynolds High School is home to more than 2,800 students many who are low income students with a household income of than average. This came out of the bottom of my heart as I read the news while at work and started to ball my eyes out knowing that i went there and multiple teachers who i had classes with still were there. 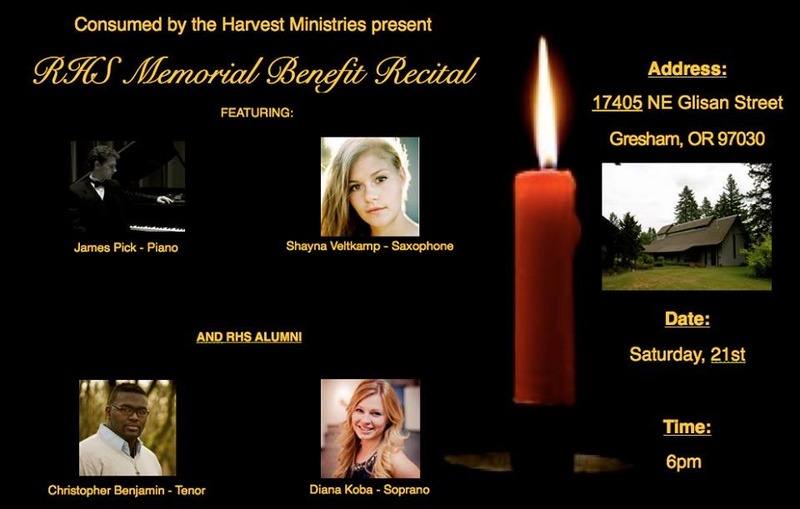 Reynolds Alumn Chris Benjamin, among others, will be hosting a recital in support of the Reynolds community and all affected. Please share the information below and attend if you can! 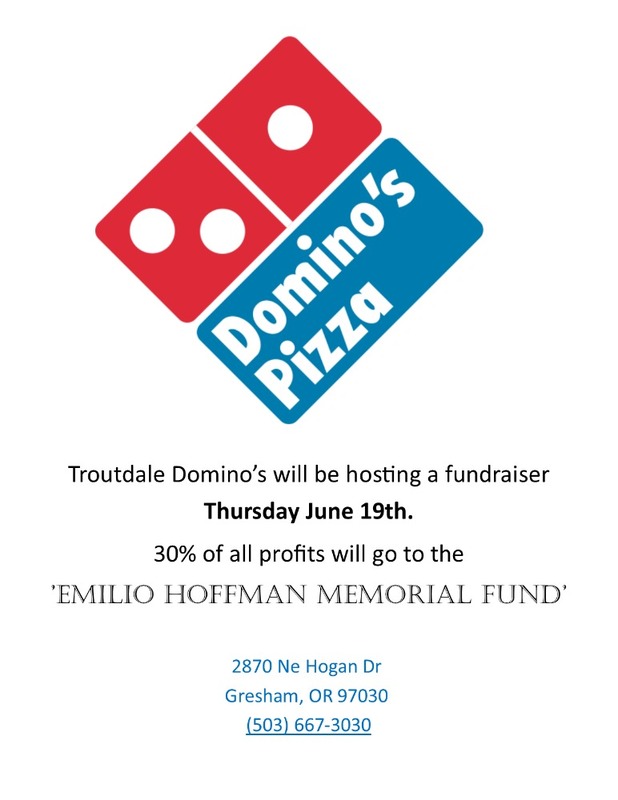 Domino's Pizaa will donate 30% of all sales to the Emilio Hoffman Memorial Fund this Thursday June 19! Stop by get some yummy pizza and let's help spread the word! Is there a flyer that we can share on Facebook for the fundraiser at Domino's on Thursday? Oh oooops.... I didn't click on it... the amount it was ORIGINALLY was a different amount. It is on their page. Scratch this last curious comment I just wrote! That has me resting assured now. I will get some money on there now and I'll keep spreading the word out on my Facebook page and family. Thanks for clearing that up for me and others because I was VERY skeptical, I'm sure you understand. Looks legit! Hope every penny goes to the family. If there are more funds than needed for funeral expenses, maybe the other money can used to setup a scholarship fund in Emilio's name. Daniela, Thank you for being so moved with emotion that you started this fund for the family. I am a mom. I donated because it breaks my heart to know that another mom is greiving the loss of her son. Please do not get discouraged by others who attack you. Let the facts speak for themselves. You were the valedictorian, a graduate of RHS, a college graduate, and currently a mechanical engineer. Bless you for putting yourself out there. I pray that you can ignore negative comments and know that many people see your kind heart. Above it says a official Bank account will be set up for the family. Do you have any updates on that? Just a note for folks considering giving; $5K for funeral expenses is very conservative. Please don't turn away just because the "goal" is met. I am sure that funds will be appreciated and well used. Good job doing this. I am one of the first graduating class alums of Columbia, before it became Reynolds. Our hearts are with all this day we never thought would come. I've donated and shared this. I believe your goal will be met within the next 24 hours or less. I hope more comes in than you're asking for. God bless. Daniela, I am an alumn, and have been wortking the alumni Facebook page to set up a fund at First Community Credit Union in Fairview. The branch manager has a daughter graduating from RHS this year and will be meeting with me tomorrow. I wanted to let you know that I will pass along this info to the alumni page and my other FB friends, and will go ahead and set up the fund at the Credit Union, I think it's best to spread the net as wide as we can. With that in mind, I think raising your target goal would be a good idea. I have lost a couple family members recently and the expenses reach well into the 5-8,000 mark :( My email is heathcurry74@gmail.com if you want to coordinate and cross support each funding effort. Thank you for doing this, financing a funeral is the last thing the Hoffmans need to worry about right now. Thank you for setting this up for Emilio it is appreciated to the family and thank you to everyone who has donated tonight to the Hoffman family. I been knowing Emilio since he was born and he like my cousin it's hard to see a young life go. Rest in peace Emilio Hoffman. I can also vouch for Daniela. I went to Reynolds High School and graduated the same year she did. She indeed was our valedictorian. This is legit. Now that that is cleared up I hope people will continue to donate to help this grieving family. This donation site was created by Daniela i'm sure to hopefully reach to her friends, and friends of her friends that may not see the donation site if it was set up by the family. She may not know the family, but she feels the pain for the family like we all do. Blow away the family with support from the community and help with this hard time, not all of us can give-- but its a reminder to pray for the family for strength for now and what they are missing in the future. I can't imagine how the parents feel. Lets do everything we can to bless this family. Thanks Daniela. This donation site was created by Daniela i'm sure to hopefully reach to her friends, and friends of her friends that may not see the donation site if it was set up by the family. She may not know the family, but she feels the pain for the family like we all do. Blow away the family with support from the community and help with this hard time, not all of us can give-- but its a reminder to pray for the family for strength for now and what they are missing in the future. I've lost young friends and I know I have pain in my heart that will always be there, I can't imagine how the parents feel. Lets do everything we can to bless this family. Thanks Daniela. I know as a 3rd party my word may not sound like much either, but I personally know Daniela and can vouch for her character and trust her completely to pass these funds on to the school. And I also completely understand people's concerns that have been stated as well :) But Daniela, even if the only people who donate on here are ones we personally know, I truly appreciate your heart and willingness to take this step to bless the family of the victim. I'll talk with Troy and see what we can donate this afternoon. Praying for Troutdale! Great to hear. The only thing that alerted me about it was how fast a donation page came up. And as I said, I personally think it should be in the terms that the family sets it up. Especially for incidents like this where a large sum of money will potentially be donated. I wish you good luck in your fundraising efforts, and appreciate your kindness to the family. Happily matching the donations raised from the Arbys in Gresham. 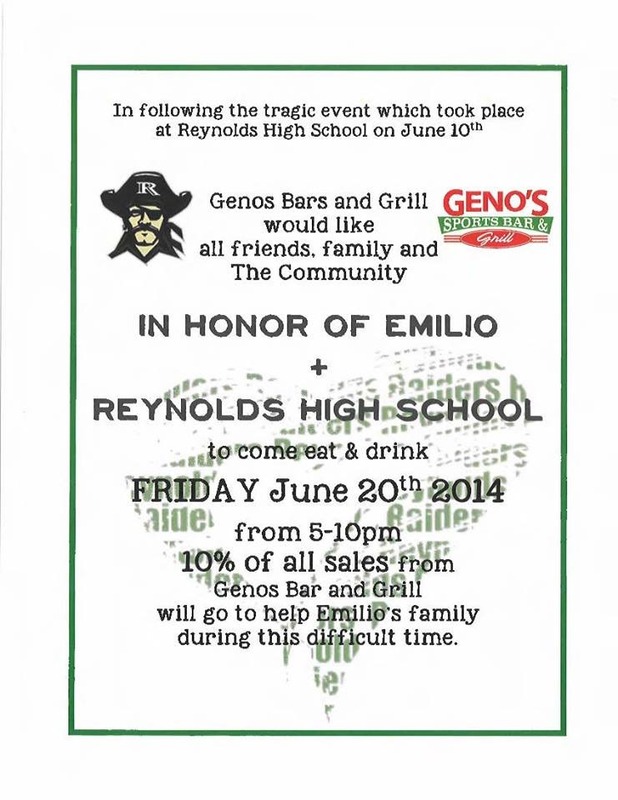 They are "Loud and Proud" and have put so much enthusiasm and support into this fund raiser for Emilio and his family. Im happy to be a part of their team, and especially happy to help Emilio and his family in anyway I can.